Despite a far northern location and chilly weather, a potential Bicycle City, Alaska, development would find many advantages. Most find the scenic wonders of Alaska more than make up for the temperatures. It does get cold, but Alaska’s reputation as a rainy state is exaggerated; technically, most of the state is semi-arid (10 to 15 inches total annual rain). Multiple possible development sites exist for Bicycle City, AK, in areas adjacent to the state’s 500,000-plus acres of national parkland. 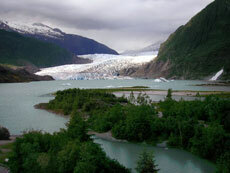 The land is spread across Alaska’s 15 national parks, including the home to America’s highest peak, Mt. McKinley, at Denali National Park. Alaska also has more than 33,000 miles of shoreline along its coasts and more lakes and rivers than any other state, with 44,600 square miles of inland waterways. Potential residents and visitors to a Bicycle City development could each explore the Alaska Trails System, which boasts 41 interconnected trails for all modes of transportation and stretches all across the state. All trails are noted for recreational, scenic and historic value. Each trail is evaluated and recommended by the Trails and Recreational Access for Alaska Citizens Advisory Board. In particular, the Anchorage Trail System presents 400-plus miles of exceptional recreation and transportation options, all accessible through public transportation. It’s a plus to possible Alaska Bicycle City development goals that Alaska’s infrastructure is in excellent condition and motor traffic is typically light. Highways maintain even grades and avoid hills when possible to ensure pass-ability in the winter, as most were built prior to most private land ownership. Meanwhile, unpaved roads such as the Denali Highway and McCarthy Road offer some of the most magnificent scenery in the world, with camping widely available along the way. Other Highlights: A high percentage of workers use public transportation and other environmentally-friendly commuting methods. The largest of the American states possesses multiple favorable elements as a potential site for Bicycle City, Alaska. Unparalleled landscape and wilderness make the state an attractive destination for tourists. Meanwhile, rising land and real estate development availability and inventory is reported by Realty Times Market Conditions, creating a swing back to a buyer’s market that could make the timing right for consideration of Bicycle City, AK. Do you think that Bicycle City, Alaska would be a place where you or your friends would consider living? In your opinion, where are the best places in Alaska for a Bicycle City? What kind of local people and organizations could benefit from building Bicycle City, Alaska? When considering a place to live, work and even retire, what sort of things are most important to you? What are some of the things about your current community that you would like to change for the better? How would you suggest we build a new Bicycle City in Alaska? What other suggestions and feedback can you offer on this project?